The White Ribbon Ride launched on the Skytower, some 186 meters above the ground with three hand-chosen White Ribbon Ambassadors on Tuesday 18 November. Broadcast on Seven Sharp, the launch featured Mark Longley, Steffan Browning MP and George Ngatai as they laced up their colourful footwear and held the first Walk A Mile in Her Shoes while battling the winds above the Auckland skyline, and most importantly, their own fear of heights. “We’re asking men to take action,” says White Ribbon Ambassador Mark Longley, “so it’s only right that we should undertake something that we’re uncomfortable with. I wanted to challenge myself to do something that I was scared to do. For some people that might be skydiving or boxing, but I’ve done those things and loved them. Walking on metal grating and glass more than three Olympic swimming pools high – that’s never been on my bucket list, but I was persuaded to do it for White Ribbon. “If I’m going to ask men to stop being silent, then I’ve got to be willing to do something that makes me uneasy. It’s as simple as that – leadership by example. On average fourteen women are killed every year and hundreds hospitalised. Police respond to a family violence incident every 5½ minutes and whether we want to admit it or not, men are by far and away responsible for the majority of the serious violence. We must put a stop to this behaviour by demonstrating leadership. As men we have the ability to influence our mates’ behaviour. It is something we can, and we must do. So please join with me by taking The Pledge. Let’s get off the side line, because it’s time we were in the game of preventing violence. There has been a great deal of excellent public commentary following Charles Saatchi’s violence against Nigella – Michael Laws perhaps misses the point in his weekly column. Where we hopefully agree is that leaving is the victims choice, however, women need to be supported whether they stay or go. It is not a case of turning the page and moving on as Michael suggests. That is a continuation of the status quo, that violence is a private matter. I disagree. Women do not ask for this violence, and are guilty of nothing that makes violence acceptable . We should also remember before passing judgement on women who stay, that leaving is a complicated decision which can involve any number of variables such as children, a place to live, shared friends, money, transportation and even social standing. The list is long and can include love for ones partner and the hope he will change. Rather than turn the page and ignore the issue we need to acknowledge that this violence is not, and should never once again be considered a private matter. When the Police are called, no longer do they drive away with the professional opinion, it’s just a domestic and let’s leave it to the family to sort out. Those dark days are over and our justice system now takes domestic violence seriously, but as member of the public, do we? That next page Mr Laws suggests we should turn over could be a hospital visit or even an obituary list. As men we need to take responsibility for men’s violence. We need to talk to our friends and use our ability to influence and change men’s perceptions before another daughter, mother, wife or child is hurt or killed. That’s why I won’t turn the page. I will not change the conversation. As a parent, I’ve already buried a daughter and I don’t want any other parent to go through that. I will use all my strength (such as it is) to help men understand that we can, and we will change our attitudes to violence against women. 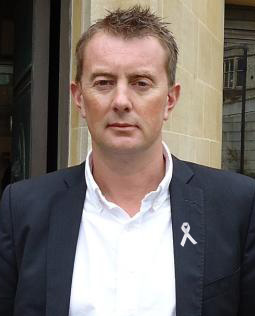 Violence is not acceptable, and I and the rest of the White Ribbon community will continue to speak out and speak to, men. I hope you’ll join us in writing the next page.